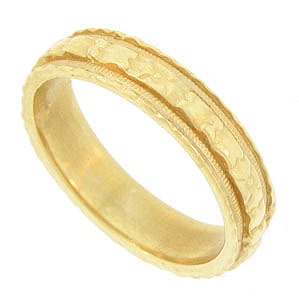 This elegant 14K yellow gold vintage wedding band is decorated with engraved abstract florals. Ribbons of distinctive milgrain and scalloped detailing frame the central design. The estate wedding ring measures 4.62 mm in width. Circa: 1950. Size 6 1/2. We can re-size slightly.